It’s only wreck’n’ball, but I like it! Screw fightin’ ’em, just rip everything apart around ’em! hard to lose that fight. The idea of tearing down all of your dysfunctioinal walls is extreme, and will likely have some serious consequences, but it could also be very liberating. I know there are days when I would like to wipe the slate clean and start fresh. It’s never that easy, but it has a certain appeal. Technically speaking, wouldn’t Alison’s punches be stronger than any object she could throw at it? Her fist being smaller making for a much higher pressure point? The added bonus of Sentinel’s own collateral damage as she tries to swat Alison directly reverbating on the wall itself instead of in the air close to the wall? Engineers and scientifically minded folks, get on it. The mass of the ball is greater than the mass of her fist. Additionally, with herself as a fulcrum, the rope acts as a lever to amplify the force input force and provide a greater output force. And a perfectly spherical object would still have a very small impact point. Yeah, inasmuch as anything can speed up that wrecking ball and sure, I guess she can lasso that thing good without a sweat. The first thing though? She’s the most powerful human on Earth specifically /because/ her own mass has no respect for the proper rules of physics. Is Alison stronger than a wrecking ball going as fast as an Alison can swing it? 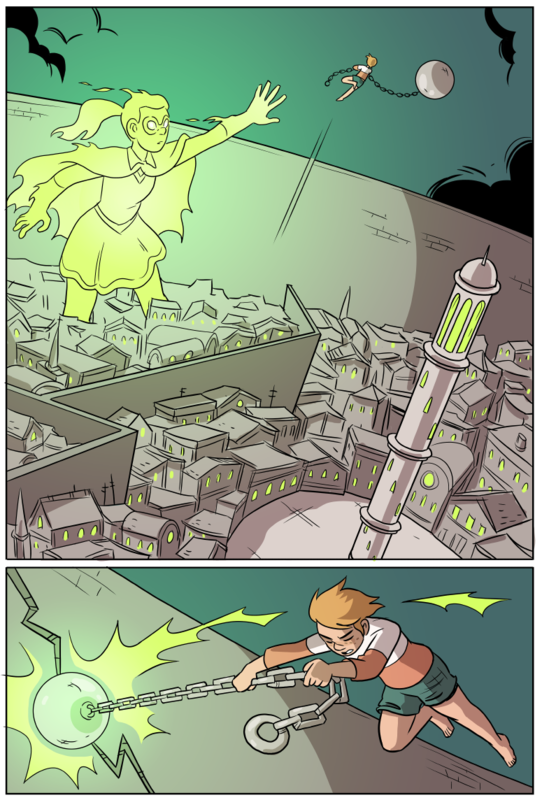 Just because she can defy gravity doesn’t mean every aspect of physics is now null and void. If her own mass had “no respect for the proper rules of physics” her strengths and invulnerability would be literally infinite, which would mean she’d be a really non-compelling character. Gratefully not morally relativistic Allison. oh please don’t start that debate AGAIN. in the past there were people just waiting for a hint of that debate to start up to jump in and deliver their opinions. Same as Superman? One of the key points of the series is that her physical prowess, no matter how great it might be, is insufficient to actually effecting change–and in fact, it often serves as a hindrance, because interacting with people who fear/envy/desire your power makes it hard to operate sincerely. Bingo. +1 for minding the class of the nature of the story. One of SFP’s beats, maybe the actual first, is that Allison can’t punch out poverty. Allison is not heroic because she’s a biodynamic, she’s heroic because she’s virtuous. This through line is consistent over and over with regard to every character. What are the laws of physics in Patrick’s brain? I think the wrecking ball is made of component. It’s quite green though. I thought the green was the city stuff. The Component isn’t strangely lacking in greens. Mhh… I’m not sure, actually. If we’re using realistic physics calculations, then Allison would have a really hard time punching any hole into a wall. No matter how hard she hit, it would propel her array more than it would damage the hole. Obviously, the fact that she can punch through walls and cars means that her power isn’t entirely based on her physical strength, and has a telekinesis aspect to it, so I guess the question is, can the telekinesis apply more force through a heavy object or through Allison’s fist? a) the force of the ball on the end of the chain is closest to centrifugal force, yes? any force exerted by Alison will be multiplied to some extent by the rotation of the chain – the ball can be propelled faster than Alison can punch, assuming a straight line standing punch (If we factor in her flight, then the math gets messy). b) Alison is more durable than any real-world wrecking ball, so her fist can theoretically exert more force over time than the wrecking ball, assuming the surface struck is stronger than the wrecking ball but weaker than Alison’s fist (i.e. the ball will begin to break at some point). Punching while flying generally assumes flight is being used to fix the position of the puncher relative to the punched. If she’s standing on the ground, relative friction would allow her to exert even more force. For some reason, brick-types in comic books continue to throw rocks, cars, buildings, and battleships even though what you say may very well be true. They seem to think there’s some advantage. And that was pretty much the end of that fight. I suspect this is more “fighting fire with fire” – using one aspect of Patrick’s mind to attack another aspect of Patrick’s mind. Exactly why we should have the Green Giant break the thing! It would be ironic to me to have Patrick go, “Oh! Yeah…” and watch the wrecking ball just vanish, but the text has established conflicting impulses in his mind, so he may not have that much control at the moment (if ever). Going “Oh! Yeah….” wouldn’t make the wrecking ball vanish. It would rather turn the wrecking ball into a giant glass pitcher of artificial red beverage, and make it go through the wall immediately. Cranes knock walls down with wrecking balls by swinging them, not by pushing the end of the crane into the wall. Because you can’t have a crane go as fast as a swinging ball? ball is heavier, tougher, and more disposable than the crane itself so its better to use the ball- also the length of the rope causes an amplification of the crane’s slewing force. Go well below freezing temperature, and it’s not… that has absolutely nothing to do with anything, but I’m the sort of person who points that sort of thing out anyway. Seems you’re not one to recognize brewing anger and irritation, though. Engineer here (civil by education, so even the right kind of engineer). Short answer, no. A big masonry wall—notably, not a dam—isn’t going to catastrophically fail because you punch your fist through it (or even your whole Alison). For that matter, they also don’t crack dramatically when hit by a wrecking ball, as depicted here; but we are pretty clearly in a land of psychic metaphor so the nit-picking is very moot. If the psychic wrecking ball can endure the strength of her attack, then she can use it to strike a wider area than her fist (with a full swing). But I think this is more of a symbolic weapon than anything. She seems to control the metal ball with her own power too. It was floating on a previous page. It’s not too recent ; I remember she used it to move the reactor back when she visited the techno-genius woman. Imagine hitting a wooden fence with a nailgun (that has enough force to drive the nail right through and out the other side), vs hitting it with an axe. If you like, the axe is also propelled by the nailgun. Well, the formula is Kinetic energy = 1/2 * mass * speed * speed. Because the wrecking ball is on a long chain you can accelerate its speed drastically (a wheel spins faster at the parts that are farther away from the middle). Alison is very much capable to spin the ball on a chain around like it is nothing, so I imagine she would be able to bring it to a higher speed than she could achieve by slamming her fist into something. The mass of the wrecking ball is also higher, but that effect is much lesser than the added speed. Lastly, the ball has a larger surface, assuming it is able to punch completely through the wall, it will displace a larger ammount of bricks. A hand thrown punch might be able to create a more focused force, but once the brick is punched out of the wall it doesn’t really matter with how much force it is send speeding out into the abyss. All of this energy will no longer afflict the rest of the wall. The ball has the advantage of localising a lot of it’s force in the first contact point, where it hits the wall with a small part of its surface, since it is a sphere, and using its wider surface to push through more of the wall after that, spreading the rest of its energy to other bricks. So, more speed, more mass and more eventually spread out force would equal a more destructive force. Unfortunatly I don’t think Alison is using the wrecking ball correctly though, so that’s on her. Since it’s a mental landscape, it doesn’t matter. What matters is that if Patrick believes she can take down his walls this way, she will. Pictured: the mental projection of everything that makes Patrick feel safe and warm and secure trying to stop everything that makes Patrick feel safe and warm and secure from destroying/fixing Patrick’s mind. I don’t think there’s such a thing as a professional in mental constructions of one’s own emotions, memories, and reality, in which you are a physically embodied entity. You know, if people would focus more on what Patrick’s problems actually are and less on how Alison is looking at them right now, I would get a lot less frustrated at these discussions. Funny enough, I don’t think his problems have anything to do with the whole “copying other minds I touch into my mind” issue. I mean, that IS a problem, but I don’t think it relates to the emotional barrier and facade. Since from the history we’ve been given, it seems like he set that up long before the other minds would have been an issue. on Tuesday… we are all stuck up here until then including that lady with an infant who left the diapers back at the platform. And behind the wall, we find a mexican cantina, and proof that Han Solo shot first. you forgot proof that there was a second shooter, Jimmy Hoffa’s bones, and a big ‘stone’ ring with weird symbols around it…. Mister menace, tear down this wall. Pink Floyd – another brick in the wall. Obvious choice for this page, really. IMO better choice: the walls come tumbling down. Yours better for the scenes that lead to him actually building the wall. Time to give a guy brain damage! Is it still considered damaging someone’s brain if you’re taking someone’s already messed up brain and fixing it? I guess it would be, since you’re altering (or “damaging”) it from its original state. In a way, I guess you could say correcting genomic defects is the same as causing damage to someone’s genome. Consider the nosebleed Alison got when she was hit by Patrick’s Inner Strength. This is a blunt process, not the gradual, specific psychological change that would come with, say, willing participation in therapy over a long period of time. I’d guess that yeah, there’s gonna be some damage. We don’t know how that effect correlates though. The damage she takes could be Patrick’s ability harming her from his, essentially, mind palace. Also, it’s not like he has a direct, proper embodiment, inside there to take damage. There’s no physical form of him, just aspects, and we don’t really know if those relate at all to his physical body. Maybe more a preference for all the same content, but in smaller panels so it runs twice as fast. I can’t argue with that I suppose. More is good. Hilariously anticlimactic if it takes her thousands of additional swings. It won’t, but just the mental image is funny. It’s a big wall! Honestly, i’m going to assume that just cracking it will be enough for his emotions to break through the rest. That’s generally what happens with emotional cracks in one’s facade. The 5th Patrick was the wrecking ball the whole time! So we can add nonconsensual psychic restructuring to her list of crimes now? I don’t think you can give consent when you are mentally falling apart. At the time this was said Patrick was not mentally sound, if he ever really was. So what you’re saying is that if someone suddenly becomes violently ill (like is having an aneurysm or heart attack), then trying to give them medical attention is the same thing as non-consensual actions against their bodily autonomy? No, no. It’s more like a really drunk person going to a back-alley “doctor” (who doesn’t have a license or diploma of any kind) and the drunk individual asking the ‘doc’ to remove their liver. It would have to be an actually necessary medical procedure upon which they would die if the person refused to perform it. That’s the only way for it to be comparable to this situation. No, I’m saying that the consent of a person who is having a mental breakdown would not stand up in a court of law. Patrick made his decision to go towards Alison under extreme stress and was displaying self-destructive behaviour when he entered Alison’s house. His consent and the validity of what he wants Alison to do to “help” him is extremely questionable, given his state of mind at the time and his behaviour. Also, if someone has a heart attack or an aneurysm, I would personally call an ambulance, since I’m not a trained proffesional. I actually was in a situation like that once and the person survived because I alerted an ambulance. If I had tried to solve the problem myself, it would have been quite likely he had died. There is no such thing as a trained professional for this case. Also, the only way to tell anyone else would be to out him as who he is and what’s going on and that would be violating his consent in a totally different way. Of course there is a trained professional for this case. Psychologists have been shown twice in this comic. Also, it isn’t really Alison’s fault that Patrick commited those crimes. Reporting a know criminal to the police takes prescedent over having their consent for it. You’re not going to tell me that you are violating someone’s rights when you are calling the cops because someone is trying to commit a crime, even if you promised them you wouldn’t call the cops. To be fair, she’s trapped in there and he’s trying to kill her. This seems like the least lethal way of trying to get him to stop doing that. It’s in self defense. Plus I’d argue she’s protected by the Good Samaritan law as he isn’t mentally sound/capable of giving consent and she’s doing her best to prevent him from dying/hurting others when there’s no way to get a medical professional to him. So I don’t think what she’s doing is criminal under legal or civil laws. You could add it to her list of ‘actions of dubious morality’ though. Tsk, everybody going for the Pink Floyd “tear down the wall” reference, and nobody quoting Miley. Naw, everybody did that before, when she showed up with the wrecking ball in the first place. Don’t worry — it WAS covered. I think it’s interesting that Sentinel doesn’t seem to be able to fly. Mega-Girl could never fly — did Patrick ever learn that Alison can? She couldn’t at least back when she was Mega Girl, as you noted. The Sentinel is probably limited to his envisionment of her at that point in time. Does it look to anyone else like Al is just throwing a tantrum? Just me? Not that it should matter. If Patrick’s psyche was so unstable that Alison could take a metaphysical wrecking ball to it then it would have crumbled/fallen apart on it’s own anyway. Al stopping to justify herself (I don’t even know what that was about) was unnecessary. Since she was just going to destroy everything anyway there was no point in ‘saving’ Anima. Really enjoying the lighting in these panels. The green lights on the city are really eerie and Al is in warm pastels. Alison’s putting the fuel to the fire tonight. It’s interesting that the projection of her doesn’t appear to be able to fly.